Candida overgrowth, yeast infections, SIBO, parasites, fungal, and bacterial infections are extremely common, yet they’re often overlooked and misdiagnosed as a root cause of digestive problems, weight loss resistance, anxiety, depression and mood disorders, autoimmune diseases, thyroid and other hormone imbalances, and even cancer! It’s estimated that more than 70% of men, women and children are infected with Candida overgrowth! Candida overgrowth is rarely mentioned in mainstream medicine unless it manifests as a vaginal yeast infection or thrush. Candida is a medical term for a micro-organism found naturally in the body. Candida, a form of yeast-like fungus is present in all of us. In healthy individuals with a strong-functioning immune system, Candida is harmless. HOWEVER, when the delicate balance of the intestinal environment changes, Candida multiplies out of control and negatively affects your health. Candida overgrowth can be topical, systemic, or localized to certain areas of the body most commonly the feet, nail beds, vaginal tract, uretha, belly button, ear canal, mouth, skin folds, sinuses, and intestines. Candida produces approximately 180 different inflammatory toxins that can make you feel fatigued and sick! These toxins affect the central nervous system, sleep cycles, cognitive and neurological function, suppress the immune system, compromise your health, your weight, skin appearance, and how you think, feel, function, and look. People with Candida who eat a lot of sugar can actually become drunk because Candida can ferment sugar and carbohydrates, and produce alcohol! Candida saturates the body with a toxic by-product call acetaldehyde. Excess acetaldehyde is similar to alcohol poisoning. Yeast by-products disrupt liver function. Left untreated, Candida increases inflammation, causes leaky gut and devastating problems that can infect internal organs including the brain, thyroid, bowel, adrenal glands, bladder, kidneys and liver, uterus, lungs and esophagus. Undergoing chemotherapy. Candida overgrowth is present in 90% of cancer patients. Is Candida Overgrowth Affecting Your Health? Candida overgrowth is a symptom of impaired gut function, immune dysfunction, and wake-up call that your body is out of balance. Sinusitis or chronic sinus infections; Over 90% of sinus problems are fungal related. Autoimmune diseases including Hashimoto’s, rheumatoid arthritis, MS, lupus, and many others. Every autoimmune disorder has a link to intestinal dysbiosis, leaky gut, underlying infections, and gut pathogens. Yes to 5 or more indicates a high probability of Candida overgrowth. Testing for Yeast and Candida. In addition to testing, it’s important to take the subjective indicators into account when assessing for Candida and yeast. A comprehensive PCR stool test provides an extensive look at the health and function of your overall gut health. It detects pathogenic organisms including bacterial and fungal infections, parasites and levels of yeast, evaluates microbiota, determines and measures major species of good and bad gut flora that reside in your gut, bacteria imbalances, intestinal pH, immune function, secretory IgA and a number of other biomarkers of GI health. Another test that I really like for detecting and evaluating yeast and fungal markers, invasive Candida and mold toxicity, clostridia, dysbiosis and other pathogens is the Organic Acids Test (OAT). The OAT test provides an accurate assessment of what is going on metabolically in the body. Not all practitioners treating yeast infections and Candida overgrowth have a complete picture of what is required for successful healing. It’s important to have a thorough understanding of the intricacies of Candida overgrowth and opportunistic infections, and the most effective method of treating it before trying any particular remedy. By randomly choosing products without understanding the true nature of this beast, you can actually hinder progress in eliminating yeast overgrowth and make things worse. 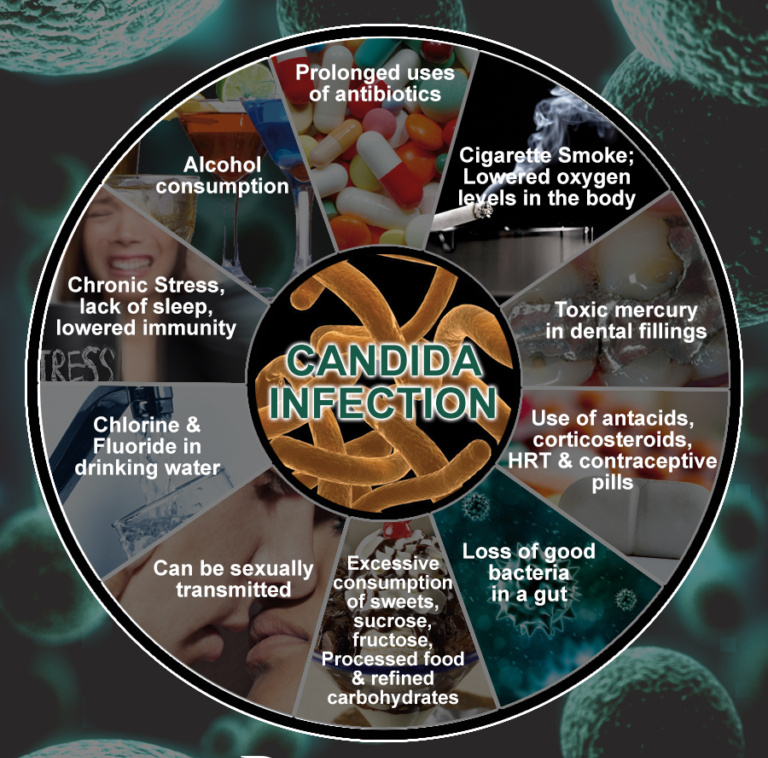 Get Rid of Candida for good! The only way to beat Candida, yeast and other problematic infections is to starve it’s fuel source, stop feeding it, destroy the overgrowth, remove inflammation, strengthen the digestive system, re-balance your body, lifestyle and environment, re-establish healthy gut flora and revolutionize your health with ongoing healthier diet, lifestyle and environmental changes. The fungus, yeast and Candida overgrowth will continue to reappear if inflammatory problematic foods are not eliminated, blood sugar is unstable (high or low), and adrenal health is in chaos. It’s crucial to learn new behaviors, manage stress, limit exposure to mold and toxic chemicals, keep the liver, lymphatic system, kidneys, gallbladder and the immune system strong and healthy, limit immune suppressors, and avoid anything that harms the GI tract. You can heal naturally from Candida overgrowth, bacterial, fungal and yeast infections, and restore your body back to health. I can help you do it the smart way!